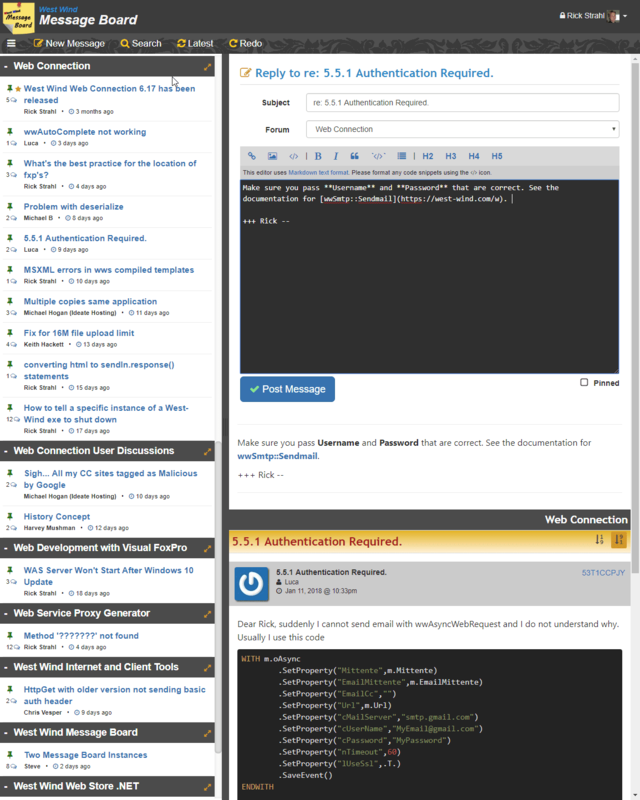 Web Connection ships with the West Wind Message Board sample application but the source code is separately stored on GitHub. The full installation is contained in the Github repository. You can either clone or fork the repository, or else download the latest snapshot as a Zip file. Pick a location to clone or unzip the repository and remember the path. The message board runs as a separate standalone Web Connection application, so it needs to be executed in its own FoxPro session separate from the West Wind demos and if you are running the full version of IIS requires configuration. The suggested location for your project is the \WebConnectionProjects\wwthreads folder, but any location really works. If you're running the full version of IIS you can run the Configure_IIS_RunAsAdministrator.bat file in the root folder. As the name suggests make sure you start this using the Run As Administrator option on the Windows Explorer shortcut menu. This batch file runs wwThreads CONFIG to configure the IIS server for the Web directory. When done it'll launch the wwThreads.exe and opens a Web browser so you can see the application run. You can also configure and run the application from within the FoxPro IDE. Make sure to launch FoxPro as an Administrator in order to handle the IIS configuration. and then run wwThreads.exe in the \Deploy folder, or DO wwThreadsMain.prg from the FoxPro IDE in the same \Deploy folder. If you need to tweak the server configuration settings for IIS, you can look at wwthreads.ini and change the [ServerConfig] settings to change the server where the configuration installs. If you make a change you can rerun wwthreads.exe CONFIG from Windows, or DO wwThreads_ConfigureServer.prg from the FoxPro IDE. If you just want to run the sample without configuring IIS, you can run with IIS Express assuming IIS Express is installed. 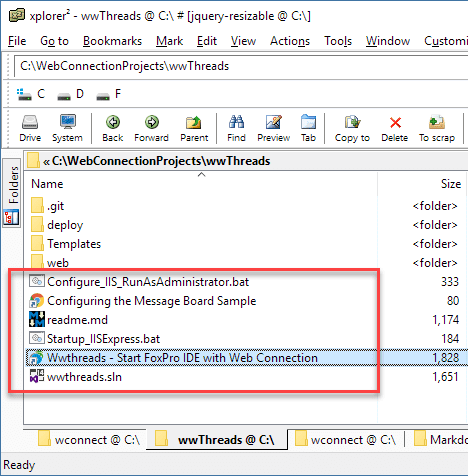 You can simply run the Startup_IISExpress.bat batch file which runs the Web Connection Console helper to configure IIS Express and start it in the Web folder on port 8081. When done the batch file launches wwThreads.exe and opens a Web browser so you can see the application run. to start IISExpress in the Web folder. Note you might have to change the path to console.exe in the batch file. The repository doesn't include the binary project file, instead it's encoded by Christof Wollenhaupt's TwoFox using GenXml/GenCode. If you want to run the Message Board inside of FoxPro so that you can check out the code use the Start FoxPro IDE with wwThreads and Web Connection shortcut link to launch FoxPro. This launches FoxPro in the Deploy folder and explicitly uses the config.fpw to load up dependencies for paths to Web Connection. and you're off to the races. You can now step through the code and make changes.